The church it’s one of the most representative Baroque churches of the historical centre, built in the XVII century, in the heat of the Counter-Reformation, a time when the cult of the dead among some Neapolitan nobles reached the peak. Built by a congregation dedicated to praying for souls in purgatory. It is located in an area called "Arc" for the presence of a tower built in the Middle Ages and demolished in the sixteenth century. At the entrance of the church defined by a gate, there are two bronze skulls and crossbones, a motif that is repeated in the beautiful baroque façade. The mortuary symbols on the facade of the church, with prayer cards, flowers and lit candles, anticipate something dark and disturbing, but extremely fascinating and mysterious, lurking inside. 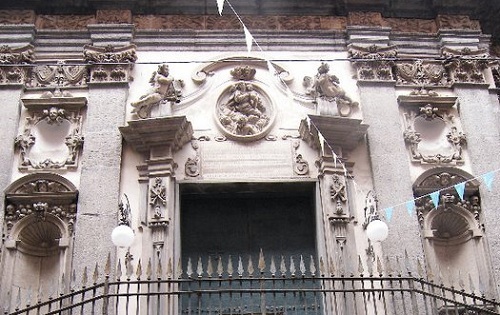 The façade with its funerary decorations was probably designed by the architect Cosimo Fanzago, while the portal by the sculptor Giuseppe de Marino. The interior, a unique nave with a reduced transept and lateral chapels, is full of light and enriched by ornamental friezes and coloured marbles behind the altar realized by the creative talent of Dionisio Lazzari. A number of great paintings and sculptures are also exposed but the real highlight is below. 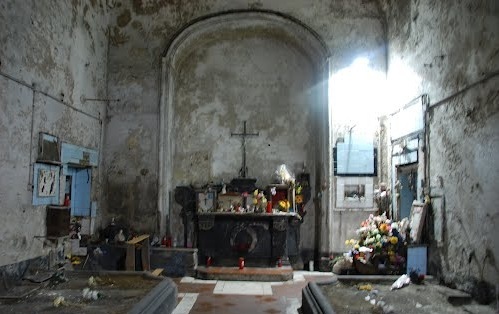 The Ipogeo : Beneath the church lies the cemetery (with graves from the seventeenth to the nineteenth century), once a privileged place for rituals designed to communicate with the souls of Purgatory. It is accessed through a door to the left of the portal. The floor adorned with majolica by Giuseppe Donato Massa. The altar is made ​​of stone and dates from the eighteenth century. 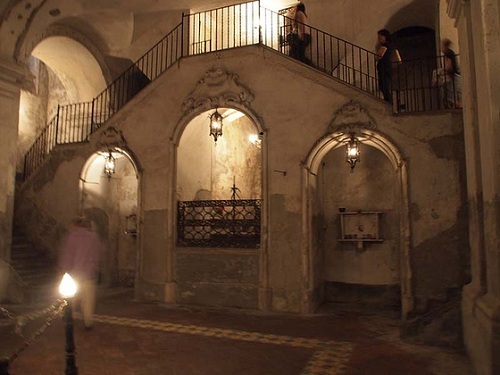 An opening on the right leads to the corridor where there are some skulls and the tombstone of Giulio Mastrilli. 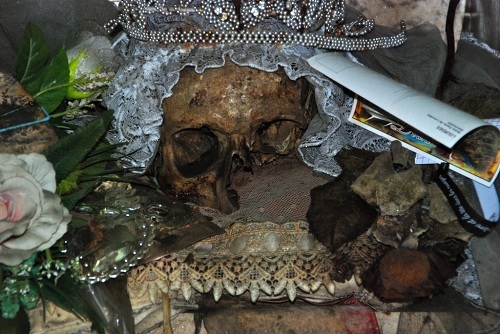 Here, among the deposited countless remains, stands out the niche in which there is a skull covered with a bridal veil and laid on a pillow, which according to tradition belongs to a girl named Lucia. Flowers, holy pictures of the saints and of various people are the votive offerings placed by the faithful who pray with devotion Lucia, asking for healing or liberation from the pains of love. The church also preserves many excellent art works like the S. Alessio moribondo by Luca Giordano, the Madonna e le anime purganti by Massimo Stanzione and the Monumento Sepolcrale di Giulio Mastrilli (among the church’s benefactor) by Andrea Vaccaro.